We are pleased to say we have a full calendar of GP14 Association training events for this year. Whether it is “pond” or sea sailing, advanced level or not, there is something here for you! Bookable events will be available via the Shop or contact Julie in the Office. Please see the details for individual events below! ATTENTION BEGINNERS AND NON RACERS – NEW FOR 2019! A relaxed weekend with the option of on-site camping. If you are interested in attending this event we would be pleased to arrange a feeder event at your club! Please contact Julie in the GP14 Office for more details. All day event, and visitors welcome. Cost approx £10. No restriction on numbers, but please contact Sam Mettam [email protected] or 07779010103 so he knows you are coming. Note: Join the Papercourt SC Open Meeting the next day to put your training to immediate use! Sea training at Llandudno prior to the Welsh Area Championships over the weekend of April 27th & 28th. Please contact Arthur Logan on [email protected] for further details. Sunday July 28th & Friday August 2nd at Plas Menai. Run on our behalf by the National Outdoor Centre for Wales with top guest coaches from the GP14 fleet. This year’s line-up includes Ellie Devereux, Phil Hodgkins, Neil Marsden, Mike Senior and Paul Simes. There are 16 places available and to qualify you must be under 22 years of age on 31/12/19. Note: UK National Championships being held the following week at Abersoch, which is only a short distance along the coast from Plas Menai. A two days of sea training prior to the UK National Championships. On-line entry will be open soon at www.gp14.org. In the meanwhile you can contact Julie in the GP14 office to get more details and register interest. Training is a key part of our service to GP14 sailors of all abilities, and we have provided many training events this year – see below! This included 2 days of training before the 2018 World Championship at Mount’s Bay SC. This is followed by an extended close-up section demonstrating clearly “how to roll-gybe and roll-tack” in light winds – great insight for all of us club sailors into how to achieve these more tricky maneuvers! 27/28 July – Mount’s Bay SC – Hone your skills and get to know the Mount’s Bay sailing waters immediately just before the 2018 Worlds. 22 June – Training at Arun YC – enjoy a pleasant evening preparing for the Southern Area Championships. 2 June 2018 – Training at Midland SC – get ready for the Midland Open on 3 June! All abilities welcome. 19/20 May – Sea training at Llandudno SC – Sea training ready for the 2018 Worlds. Two full days on the sea at this popular venue! 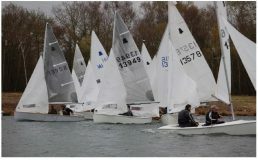 15 April 2018 – Welsh Harp SC – An advanced crewing day following the WHSC open on 14 April. This event will focus on crewing skills and is open to any boat with a crew that wants to get better! 1-6 April 2018 – Portland (Weymouth) – Craftinsure E Howard-Davies Youth Training Week. A residential week with top GP14 coaches. Open to all youths who want to sail in our championships. Six boats, glorious weather and light breeze plus a top-notch coach, what is not to like! We all learnt loads of stuff about tuning for light airs as well as getting some special Gold Fleet nuggets! Lots of roll-tacking and spinnaker gybe practice, finishing with some capsize fun for those wanting to cool down. A big thank-you to Neil Marsden for leading a brilliant day and Hollingworth SC for hosting. October 2016 – Llandudno Sailing Club – Sea Training.